After working for the Stockholm police for several years, Eric returns to his home village to live with his younger brother Leif and work in the local police department. At first welcomed home with open arms, Eric soon forges a path of estrangement and destruction when he single-handedly sets about solving an on-going case concerning the slaughter of local reindeer, a problem that the town cops have been plainly ignoring. When Eric learns that his brother is involved, events take a further turn for the worse and violence erupts in the village as the closed-community unites against Eric’s quest for truth and ultimately, justice. 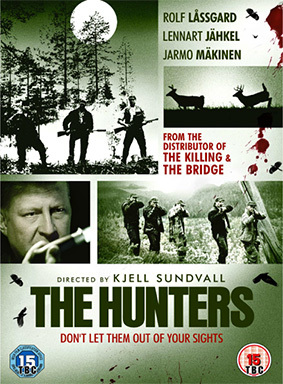 Directed by Kjell Sundvall and starring the original Swedish Wallander, Rolf Lassgård, The Hunters (previously released in Sweden under its original title Jägarna) is a gripping but (in the UK at least) too little seen Scandinavian thriller, the 1996 predecessor to the newly released False Trail (Jägarna 2), which stars Rolf Lassgård, Peter Stormare (Fargo, The Big Lebowski), Annika Nordin and Kim Tjernstrom. The Hunters will be released for the first time on UK DVD on 10th December (yep, next week) by Arrow Films at the RRP of just £12.99. Trailers are hard to come by for this one, and the one below has no English subtitles.